Be sure to enjoy recreational amenities including a sauna and a fitness center. Additional amenities at this hotel include wireless Internet access (surcharge), tour/ticket assistance, and barbecue grills. Grab a bite to eat at one of the hotel's 2 restaurants, or stay in and take advantage of the 24-hour room service. Snacks are also available at the coffee shop/café. Need to unwind? Take a break with a tasty beverage at one of the 2 bars/lounges. Buffet breakfasts are available daily from 6:30 AM to 11 AM for a fee. 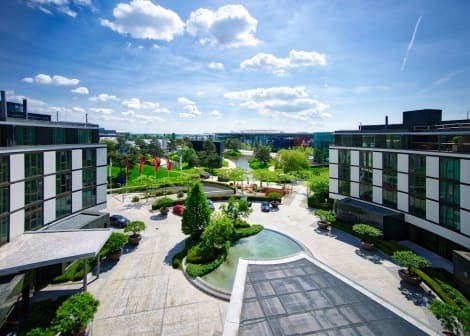 This modern hotel provides a privileged location in the heart of Wolfsburg, within walking distance of the train station and Volkswagen Headquarters. At the Leonardo Hotel Wolfsburg City Center, start the day at the extensive buffet breakfast or dip into the Carousel Bar day or evening to enjoy culinary specialties and a wide selection of drinks. The hotel also has an indoor pool and sauna. Each room features free Wi-Fi, double-glazed windows, HD TV and bathroom stocked with Sea of Spa products. Enjoy recreation amenities such as a sauna or take in the view from a terrace. This hotel also features wireless Internet access (surcharge), a television in a common area, and tour/ticket assistance. Best Western Premier Hotel An der Wasserburg in Wolfsburg - Historic framework architecture in the middle of romantic nature. Our lovely restored hotel brings our guests a unique ambience of modern art in a historic frame. No matter if you are a business guest for meetings or conferences in our own modern conference center or if you are enjoying our excellent kitchen in one of our restaurant or you are just relaxing in our Spa area on the roof top with an excellent view. Our hotel is located close to the city center, the Volkswagen factory plant, the Autostadt and the Soccer Stadium Volkswagen Arena. You can get there by car in 10 minutes. lastminute.com has a fantastic range of hotels in Wolfsburg, with everything from cheap hotels to luxurious five star accommodation available. We like to live up to our last minute name so remember you can book any one of our excellent Wolfsburg hotels up until midnight and stay the same night.